Toni Nealie is the author of The Miles Between Me, an essay collection about homeland, dispersal, heritage and family, published by Curbside Splendor. Recent essays have appeared in Guernica, The Prague Review, The Offing, and The Rumpus. Her essay “The Displeasure of the Table” was nominated for a Pushcart Prize. Originally from New Zealand, she holds an MFA from Columbia College Chicago. She teaches and writes in Chicago, where she is literary editor of New City. Toni was interviewed on the afternoon of October 10, 2016, in a conference room at Columbia College Chicago. She had just finished teaching back to back Writing and Rhetoric courses and took a few minutes to decompress before we started talking. During this time, Toni told me a story about her ongoing fight with a tree-removal service that had promised to take care of a tree on Toni’s property that had been badly damaged by a storm. The anecdote was amusing but also showed that Toni, though diminutive in stature, is herself a force of nature not to be taken lightly. Andrew Gregory Krzak: What was the length of the process from when you finished The Miles Between Me and when it was published? Toni Nealie: I finished writing it in 2014, and then it got accepted in 2015. Editing took place summer of 2015, and it was published in April of 2016. So, you could do the math on that. I was at Printers Row listening to Roger Reeves’s conversation with Tracy Smith, the poet, talking about how it takes forever to write and publish your first book and then the minute it comes out people are asking, “What is your next thing? What’s your next book?” But it does take a long time to publish the first one. TN: Hmm, I have been busy doing stuff with this one. So, it’s been six months since publication, and I have probably done more than twenty readings and quite a lot of interviews. So, I have been kind of fully immersed in the process of this book, the promotion of this book, thinking about book I am kind of done with it. I think I have got two more readings coming up and then I just want to put it to one side. Although, it’s open the door for other opportunities, so now I have been asked to write other things, like for publication. So, I am coming to the time where I want to put some of that stuff aside and carve out time to do new writing. I am quite a slow writer. It takes a while to get to whatever I want to say and how I am saying it. Although, some of the later essays in that book that were done after the initial manuscript, they took a lot less time. So, hopefully the next book will go faster. I’m not working on anything right now. AGK: Are the essays that you have been publishing and working on subsequent to this book like when editors, publishers are approaching you for them, are they asking for things in the similar theme and field, things about what it means be brown, what it means to be foreign, family, these types of things or are they just saying, “Hey Toni Nealie, you’re a known commodity. Give us some work.” What freedom do you have as a writer, in growing as a writer, in moving beyond this book towards new stuff? TN: Well, that’s a big question. I have been asked for some quite specific things. So, you know, I just blurb someone else’s book, my first blurb, and I was asked to do that because there were some overlapping themes, so motherhood and borders I would say would be the two commonalities and it was a book on essays. I have been asked to write another essay, which is about an international theme, but it is not specifically related to the thematic material of the book. And I think I am kind of leaping beyond that now. I’ve dealt with this material and moving on. AGK: Oh, yeah. Germaine Greer, who says that “Gardening is a good defense against memory, for it is all in the future.” Which I think it is an amazing quote, but I think it’s right for discussion on the context of a memoir, you know, so, in memoir I am trying to think of a suitable, sort of metaphor, to fit with this but you are kind of digging through the soil of what was. How difficult was it for you to go back to some of the topics which you brush on, obviously not pleasant, in the first section in the treatment of yourself and these hideous American airports when you are coming back to the country, and then this sections later on when you are discovering things about your father. AGK: I’m sorry, I apologize. Grandfather, and then your brother, Robin. So, how do you, in writing these things, do you agree to have gardening when it is all in the future, or is it worth it to do all that kind of digging? TN: It was worth it for me. You know, writing to make sense of things on the page, that is try to piece together a meaning was totally worth it. The pleasure of writing, I guess, is an end it itself. I got a book out off it, that was published. So, yeah, the excavation was worth it. AGK: Well so, in the more specific way . . .
TN: Right, and I thought that was such an appropriate quote from my mother, who I feel like she gardened her way out of her difficult past. In a garden, it is promising that I see that and especially here with the four seasons, so you have that, that pregnant time, and then the flourishing and the new growth, the prospect of renewal of what you see in a garden, you see it in religion as well, but I’m not religious. AGK: I think it’s always strange that we start here the new year in January when everything is dead versus saying the same new year is, say, March 1 or April 1, a time when things are actually opening or restarting—that’s just an aside. TN: I never thought of it like that. I mean, I am used to opposite seasons anyways. A new year is summer—a new year is summer vacation time. The start of the academic year tends to be February so it took a while to adjust to here, but the four seasons, I mean I am not used to four distinct seasons either. AGK: So, you just have two? TN: It depends on the climate, depending on where you live. In the North of New Zealand, it gets kind of cool, but the far north it’s never really cold. The further south you go, if you go near Antarctica it gets cold and the mountains it snows, but you don’t have winters like here. AGK: One thing I would agree, obviously this is not a traditional memoir by any means. Rather a collection of interwoven essays. One thing that’s always bothered me about memoir is that they say it comes from a Christian tradition of confessions of Saint Augustine. And so there’s a school of thought that every memoir has to have some epiphany of some kind or something like this in the end. Some transformation of the character. Would you say there’s such transformation, given that this is more a collection of essays than a memoir? Would you say there is some transformation that you do explore in this like sort of Americanization of yourself? Because like you’ve said right, “Oh, I have to think of it that way because the weather, unlike New Zealand, it’s different.” Being how many years Americanized—or Americanizing— you still sort of have to calibrate from the mindset of a New Zealander? TN: So every time I write the date, I have to think about how to write it because how we write the date is the other way around. Fifteen years later and I still have to do that every time. Transformation memoirs, there is a distinct narrative arch towards an epiphany and some kind of resolution in the end. This does not have that. Or maybe it does in a slightly more delicate way and the way that it is structured with the two bookend essays with coming to America and the son going off. I talk about how in that last essay, I see “Now I appreciated the muted splendor of the cornfields. Nothing flashy or overly dramatic. Just a quiet goldeness laid on between the horizons offering itself to me if I paid close enough attention.” I think I’m saying that now I am paying attention, I am fully present where I am. I guess this is close to an epiphany as you get, but I’m comfortable here but then I pull back from that because every time I do that, it’s an essay on the cutting mat so I don’t think there is any last memoir resolution. AGK: Well, that makes me happy because I don’t know—I don’t think we’re aware of such cinematic changes in our lives. We change gradually over time and to have this expectation in some styles of nonfiction that there has to be some operatic thing happening. That is seriously flawed expectation. TN: Lack of resolution suits me and the essay form suits me, but I think memoir and the narrative arch suit a lot of the reading population, and I think if I were to write a memoir and structured more like that, I could have probably sold it to a bigger publisher and had a bigger book sales which is what I wanted to do with this one, but it might be what I want to do with a future work. TN: I’m very happy with this, with the book I made and I’m really glad I’ve got a small independent publisher who gave me good attention, and I was able to gain confidence and get my feet wet with the process of figuring things out like, how do you put together a book? How do you go out in the world with that? AGK: That actually is an awesome lead-in because I do have some questions about the editorial process of the book. How much did you, on your own, already see arranged? How helpful was an editor or publisher being like, “Oh, let’s do this in three sections?” Can you talk a little about that process? TN: Yes, so I had a full manuscript of it to begin with, which was with the publisher for six months, and I had sent it to another two publishers, and I also queried an agent who represented authors I liked very much but doesn’t represent essayists, so when my publisher accepted it, we didn’t initially talk about structure. I worked on the essays with Naomi Huffman, my editor, who was really great to work with, and she also has a degree from Columbia College Chicago. She loves essays and she was great to work with. We changed the structure really late in the editing process. I had gone backward and forwards with ways to putting it together. There was one big essay that got cut—had thirty pages taken out of it. It was a big floppy mess. And I needed some more work to put into it, things that I didn’t intend going into it ended up going into it. They somewhat needed to be reshaped to suit the nature of the book, but we decided on the three parts based on the first one. There was a logic to it. (Laughs.) I can’t remember what it was now. It seemed to make really good sense at the time, but they are grouped together for a particular reason. AGK: So you have “Unraveling,” “Bequeathed,” and “Miles Between Me” as the three sections names. I think in the first section—and I’m only saying this to maybe jog your memory, I’m not putting in my two cents—”Unraveling” is you’ve uprooted and are giving up your entire way of life and a ton of personal accomplishments and career in things like this to just come to this country that is frankly hostile towards you when you arrive. Then, “Bequeathed” takes on a softer tone. TN: “Bequeathed” was more the domestic. I think “Unraveling,” yeah, were all the things that were unraveling both for me personally and a broader sense like the nation was going to war, paranoias about the borders, and the recession of 2008, which is what the actual essay “Unraveling” concerns itself with, issues with health. Bequeath was more, was that the section that was more concerned with the domestic? AGK: Well, “Bequeathed” is the one with the essay you have about your brother for example. TN: Yeah, so the kind of things that I carried with me, so some of it concerns itself with the domestic: children and family. And then the last section is about journeys, I guess. “The Miles Between Me” is more specifically about journeys, different types of journeys. So yeah, there was an organization. AGK: Fair enough (laughs). So you use a term, in the essay about Robin and the earthquakes in New Zealand,“solastalgia,” which is concerned with the loss via physical destruction. To what degree is “solastalgia” linked with just regular old nostalgia? Do you find yourself, especially in the first section, doing maybe an unfair comparison to the successes you had in New Zealand and living in New Zealand to coming here where your hands are bound every step of the way? Did you make New Zealand, perhaps, more Edenic than it was? TN: No, I think I felt genuine nostalgia. When I lived in New Zealand I was having a really great time, like life really doesn’t get better than this. Then, coming to Chicago at that time, and it was such a horrible time. I couldn’t have picked a worst time to be here. I think I probably would have had challenges anyway, but 9/11 was an insane time. It was a crazy time for everyone, for Americans as well. And New Zealand is a very beautiful place. I had a beautiful view from my office. There were a lot of things that just were easier at the time. And I say at the time because this is a specific time. There’s been a change of government since then and it is not the place I left. I just got back from there and things have changed. If I were writing right now…who knows? But I do skewer the nostalgia. I do catch myself feeling nostalgic and I question that and poke holes in that as well. So it isn’t pure nostalgic. AGK: It’s tethered to the reality that you’re aware of. TN: Yeah, and the thing is that the essayist is looking over their shoulder and querying not only content, the subject matter but also querying their own activity while they’re doing it. Like rubbing your hand on your head one way and on your stomach the other way at the same time. Yeah, so I think that’s what’s going on. If that makes any sense at all. AGK: It does. So you were telling me that you’ve done over twenty readings for this, promotional stuff. And then I recall you reading the “On Theft” essay at an event that I saw you at. TN: It was my very first one! TN: Mmm-hmm. It was two days before my book launch. AGK: Yeah, I remember it was an exciting and hectic time. It’s great to be able to see at that very specific time. TN: It was an insane time because I was trying to do the Lit 50 for New City, and I was almost at the end of the semester, and I don’t remember much about that entire month. It was just a blur. AGK: Yeah, the more stress that I share with you, with everything that is going on, just in terms of commitment; I swear I feel like some kind of punch drunk boxer. Like I can’t even remember how I got into this room. (Laughs.) I think that’s just this whirlwind of stress, like a defense mechanism. Like you’re successful, you doing what you have to do, but a part of you is just floating through, which I think is interesting. TN: Yeah, you have to slow down and smell the roses, because otherwise, the roses are long dead. Like it’s long gone, it’s ephemeral—you can’t capture that. I did say no to a couple of things and Aviya (Kushner) told me off for pulling out of something. I thought about it and I said yes to a lot of stuff, but no to very few things. So I thought about it and thought, well, some of that depends on your stage of life and what you want to achieve and I need to be sane. I have children. I need to be able to get up and have my household running and not be a completely crazy person and keep all those other balls in the air. I think any parent has to juggle a bunch of different responsibilities. I’m pretty adept. I’ve been doing that for a bit of a long time now. Twenty-two years. But I do think it’s important to slow down. AGK: It’s hard to control your own pace when something like this does hold, especially as a mother, a wife, someone with their own work, a dog owner. Especially a hairy dog, because you got to brush it all the time. But yeah, there’s that fear of saying “no” to opportunity, but then there’s also . . . “Well, I said ‘yes’ to seventy-nine percent of these things,” but the one thing you say no to makes you a difficult person. TN: Well, yeah, it’s interesting because this is all part of, I guess, the business of publication, which I’m just learning about. I’m glad I have this opportunity in this kind of way to learn about it because if I do whatever my next project is, I’ll have all this information. I just read this book by Dana Kaye which is about doing publicity and I wish I read it at the beginning—I recommend it—Because she is really good at saying, “You have to figure out what is this worth? What is this going to get me?” So some things are really important like are they going to get you the kind of audience that you want to get. Other things might not be important in that regard, but you’re trying to build a relationship or pay something back or pay something forward. I did a reading at a bookstore in Ann Arbor, a really great bookstore, and there was hardly anyone there because I didn’t know anyone in Ann Arbor and the University of Michigan wasn’t in session. This really great bookstore is fairly new and trying to do something. That was a case of paying it forward. I’m not going to benefit from it. They will. Hopefully, it helps them build their audiences for the future. And who knows, maybe some day it might be useful for me. But it’s not always evenly reciprocated, but I’ve learned that from my husband—he gives a lot. He’s always given a lot and he gives a lot away. You know he could be a really rich guy by now probably. But the wealth has kind of come back in a variety kind of ways, not necessarily in financial terms, but in creative, artistic, and relationship terms. Even though whatever that thread is going to lead to, it’s a much more fun way to live life I think. AGK: On the subjects of readings, now, how would you say that reading your work in front of an audience informs the way you write on the page? Because somehow, I don’t know, I’ve always written for the ear and for talking, I write a lot of scripts and things like that so always more conscious of that, so when I have to write something for the page and then I have to get up and read it, then I’m like (makes nonsensical noises) and my mouth is going every which way. Do you think that there’s a linking of these two? I mean now that you’re a seasoned pro in reading your work, do you think there’s a loss of intimacy with someone who’s reading your book in silence or do you think there’s more intimacy or a camaraderie with you in front of the room reading your work? How do you as a reader dealing with this? TN: Okay, these are really kind of follow the breadcrumbs kind of questions. So writing for the page and reading for the ear are different. Well, I know this, not so much from my writing, because it’s largely written for the page, but I’m also conscious of sound and partly I do often read my writing aloud when I’m in the editing process. This is something I really encourage students to do, not just for the sound, but it’s a good way to see if it actually makes sense. To hear it orally gives a difference sense of it, but I noticed going to the Reading Series, the huge difference between people who write purely for the ear like storytelling, there’s a distinct structure—beginning, middle, and end. Often, I find a lot of that work very formulaic. But also poets, I listen. I didn’t really do this until I did my MFA here, I did not listen to a lot of poets, but now I really like to listen to poets, because they write both so conscious of the rhythm and sound of words. When I’m reading things out loud, when I’m reading I select things for the audience. What kind of audience am I reading to? When I’m selecting an essay, how much time do I have? Can I read a complete essay or can I read part of an essay? And am I reading with or for poets? That makes a real big difference. So if I’m reading with poets, I don’t want to sound kind of too narrative. I’ve read with poets and I’ve selected things that aren’t in the book that started off as lyric essays that didn’t end up in the book because the editor didn’t want it in there so they kind of ended up being merged with essays. But I have written them as stand-alone pieces in other contexts and I think they work real well. More like little lyric-essays or prose poems. If that makes sense. TN: So there are some things that I have not read out loud in this book. I’ve never read “Rupturing,” I’ve never read that one about my brother. AGK: It would probably be painful to read it to a live audience. Or do you have a distance? TN: I haven’t had the right environment to read it in, I think. I almost read it. I recently read with a South African writer whose novel features a brother figure who dies, so I thought that would be a good pairing, but it was a noisy environment, so it wasn’t right, and I didn’t read it live. I needed something kind of quiet. AGK: One problem I have with a lot of readings is the expectation of the audience—which is an appropriate response for an essay like “Rupture”—that they have such reverence even when a piece is meant to be humorous. They’re so polite and there’s almost no “give back” to the reader, to the author to sense that the audience even alive enough to be there. I just think there needs to be some break—not like you’d find in stand-up comedy—but more oral traditions and storytelling with readings to somehow interject a little more life into this sort of monotony of the reading experience. I don’t know. TN: Yeah, I read one actually—“Rodents.” I’ve got a section of “Rodents” and actually got people to read the segment, I don’t know if you’ve read that one, but there’s a piece where it’s kind of like a script of The Godfather that’s sort of like the rat that came into my house, so I got other people to read the part of The Godfather and the husband. So then it was funny. It was obviously funny, but yeah, it does depend on the work. The “Rodents” one is mainly kind of feeling alive; it’s not all gloomy. AGK: I think this will be our last question, you’ve actually gone like forty minutes. Does it feel like that to you? (Laugh.) Quick break. I think just some final things like that . . . I’m impressed by the amount of quotations that you used from a lot of writers that you admire, and you’ve worked them into a lot of the essays sort of like to highlight thematic things. My favorite one came in the beginning of the book with, “’Risk anything,’ wrote my countrywoman Katherine Mansfield. ‘Do the hardest thing on earth for you. Act for yourself. Face the truth.’” So to me that could be a quote at the very end of the book. Cause I think you’ve talked about all you’ve come through and you arrive at where you are. So can you talk to me a little about Katherine Mansfield, what she means to you, the importance of that quote, and why it’s in the front? TN: It’s actually one of my favorite quotes. It’s often been above my desk and in various locations. It’s been in my head for as long as I remember. I can’t even remember where she wrote it. She’s a New Zealand short story writer who wrote it in the nineteen—I can’t remember when—early 1900s? Around the time of the Bloomsbury writers. And it wormed its way into that essay. These essays were written in different periods so I wasn’t thinking of that quote outside that context. It probably could have been at the end, but when I was writing the essay, I wasn’t even thinking about the book. It was just an essay at the time. There were a lot of quotes that I took out because it started as an MFA thesis. Or part of it was. Some of the essays I wrote after the fact, but most of it was written—Well, the draft, was written in 2013— and it had a lot more quotes and was more “MFA-y,” and I didn’t want it to be read like an MFA thesis so it got changed. And there were quotes which when I read I was like, “Oh, my god. This is really quite turgid” and so I think it got balanced. I don’t know whether it has too many quotes? TN: But I did say to my editor “please, make sure it doesn’t read like a—” Because they are for two different purposes. When you’re fulfilling an MFA, you’re writing for an academic audience. This is more for a general audience and I needed to be conscious of that and just not make it too pretentious. I found that I was in a curveball with a bunch of people who had creative writing degrees already, which really I did not have. I think, at times, I was trying to impress either my instructor or them rather than doing what I needed to do for myself, so that came later. This is me and my work, there’s no one in the room now. Andrew Gregory Krzak is an MFA student of Nonfiction in the Creative Writing Department at Columbia College Chicago. 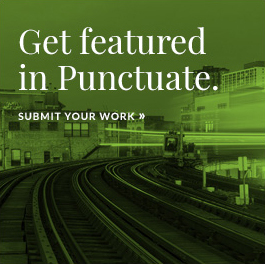 Punctuate is a nonfiction magazine of the Department of English and Creative Writing at Columbia College Chicago. Published year round online.